New Year resolutions. Can’t say I’ve ever really done them. I suppose we’ve had discussions about the future year, but reality tells me just because you decide to do something on Hogmanay does not mean I will commit to it. Actually, if I decide to do things at another point in the year then they will happen, ‘cos I am a bit sad like that. 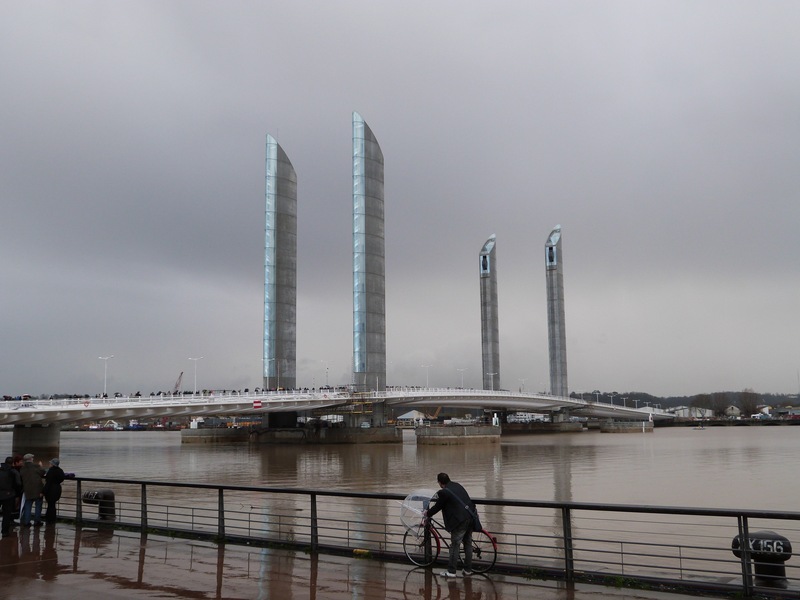 Actually I did decide to DO something and on 1st January too – and set off for Bordeaux first thing in the morning (no partying on Hogmanay) as the new bridge over the river was being opened to pedestrians just for the day. After a virtually traffic free journey, we arrived about 10.30 and found we could follow the crowd who all had the same idea. It was well organised, with lots of police and security. Mainly to stop people being able to get right to the edge of the bridge I think, as we only allowed to walk on the centre section, that will be the road in due course. Everyone was given a souvenir ribbon bracelet, saying “I walked over the bridge on 1/1/2013”. The weather was a mixture of very heavy showers and sun, and we sheltered for a bit under the canopies of shops on the left bank until the worst passed. It was a really family occasion, with all ages represented. A few people looked like they had come from parties. Everyone had a camera or were using their mobile phone to take photos. It was relatively quiet when we crossed, but I saw photos later and it was shoulder to shoulder, and many people turned up late and didn’t get to cross. 38,000 people were reported to have turned out. The Pont Chaban Delmas (named after a former mayor of Bordeaux) is quite a feat of engineeering, with a span of 433 m and an centre section which elevates to 53 m in 11 minutes to allow ships to pass below. They expect it to be raised about 60 times a year, and hopefully it will help traffic congestion on the other bridges. The bridge will officially open to traffic on 17 March. Maybe we’ll decide to be part of that too!